The bold design of this military-inspired watch is guaranteed to get you noticed. 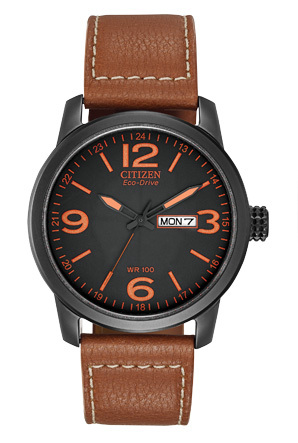 Featured in a black ion plated stainless steel case and a handsome leather strap, this timepiece features a smoky black dial with eye-popping orange numerals, day/date, and a 42mm screw-back case. Water resistant up to 100 metres.